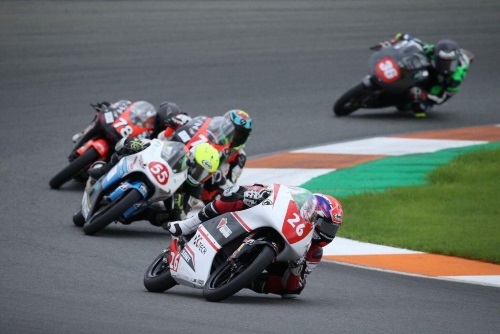 VALENCIA, SPAIN (September 11, 2018) – Canadian Jonathan Finn’s PreMoto3 weekend at the 4.0 km long, 14 corner Circuit Ricardo Tormo in Valencia did not result in the expected outcome after a hard charge through the field this past Sunday. Rain would greet the riders for the start of Saturday’s qualifying sessions. Finn was first out on track and was eager to recover from the previous days performance and set good pace. Unfortunately, two laps into the first qualifying session he would mistakenly touch some of the painted track surface and would low-side. Remounting his machine quickly he attempted to rejoin the session but unfortunately the bike was damaged, and he needed to retire to allow the team to make necessary repairs for the second and final qualifying session later that afternoon. “I’m extremely disappointed with how today went. Everything felt good during the first qualifying session before I low-sided. I really wanted to make some progress to get some confidence for myself and my team.” said Finn, who eventually qualified 24th out of the 26-rider field.